This is a guide to show how you can improve two of the least loved Nerf gun attachments, the "dual-mode light beam" and the "flip-up sight" that come with the Recon. 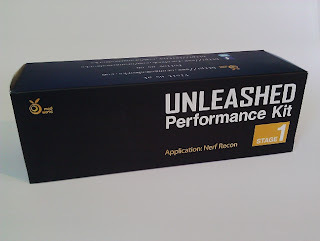 If you think that these parts are completely useless, then this guide is probably not for you. The light beam mod has worked fine for me, even with brand new Lithium batteries, however this is not a guarantee that it will work for you and it might blow the LED - although that is unlikely. 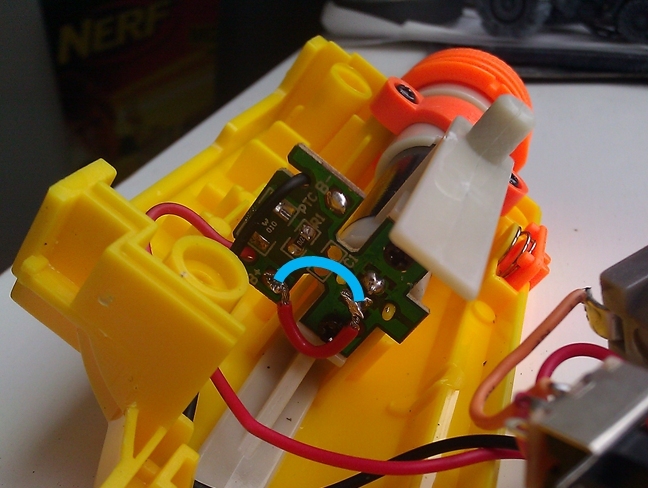 The flip-up sight mod is not reversible, so be sure that you want to do it before starting. As usual, I am not responsible for any injuries or damages that occur whilst following this guide. This mod noticably increases the brightness of the red light. It is simple to do however you will need a soldering iron or hot glue gun. 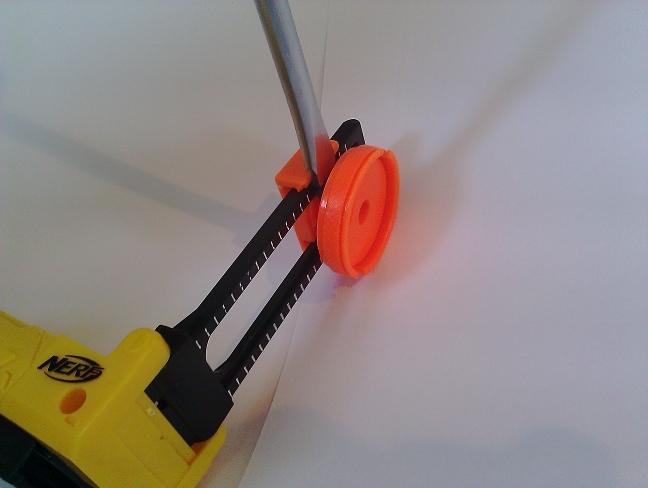 It could probably be done with other glues or tape but that may be tricky. Remove the battery cover (by unscrewing the screw that the arrow is pointing towards), then put some AAA batteries in, it is easier to do this to start with. 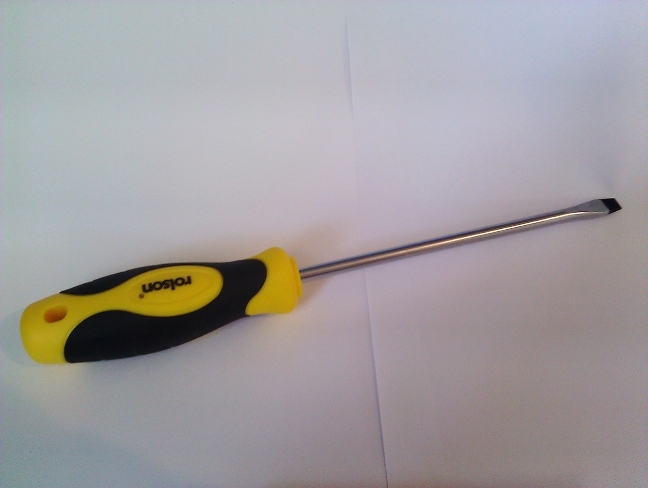 Test that the light is functioning then unscrew the remaining 5 screws. A small wire or even paper clip can join the two points. Be careful not to leave the soldering iron or hot glue gun on either contact for more than a few seconds, as you might heat up the LED too much causing it to break. You wire needs to go NOT where my red wire is, but where the blue line is. I had to later bend my red wire into that position because it blocked the notch on that side of the circuit board. Put the everything back together, check that it still works, and then put all of the screws back in. Your light beam should now be a little bit brighter! I'm might look into replacement white LED's and other ways to improve this accessory. I tried some I had lying around and although they made better torches (being white), they were not any brighter than the red. This simple mod (or "removement") makes the sight a viable option to actually use in a Nerf gun fight. With the orange piece on, the sight is very difficult to see through/look down as the hole is so small. Even if you do manage it in the heat of battle, you won't be able to see where your dart goes because it will probably be off to one side slightly. This is just as much a cosmetic modification as it is a functional one, many people think the sight looks nicer without the orange piece. If your not yet convinced, watch the short video. Find your biggest flat-head screwdriver, this is the only tool you will need. 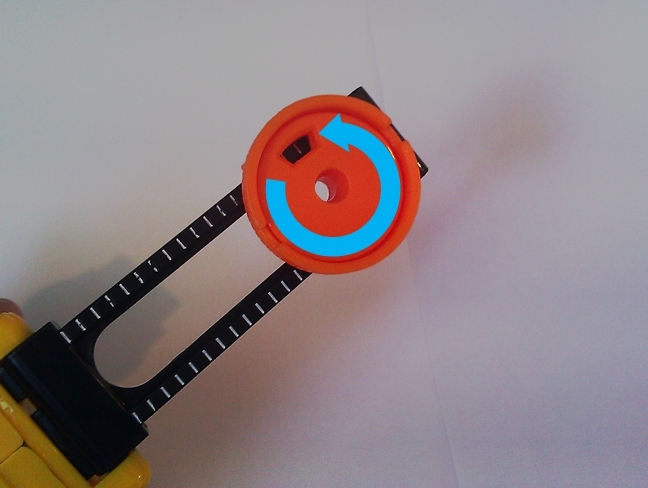 Rotate the circular piece counter-clockwise as far as it will go to loosen it. This will also make it slightly further away from the black bits we want to keep intact. Position the screwdriver as shown here, and slowly wiggly it in pretty much every direction, trying to seperate the front and back orange pieces. Try not to bend the black parts whilst doing this. 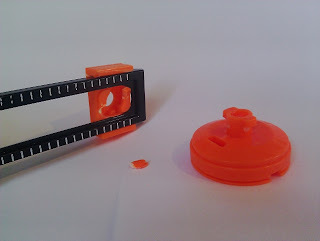 If it seems very hard to seperate the bits, try flipping it over and doing the other side. You will need to use quite a lot of force. You should end up with a few "broken" parts like this. You can pull off the orange back piece and your done! I hope you found these little guides useful, or at least clear and interesting. Are there any more simple mods for the Recon I could do articles on? On the subject on modding this gun, I got this in the post a couple of days ago, expect a full review soon! 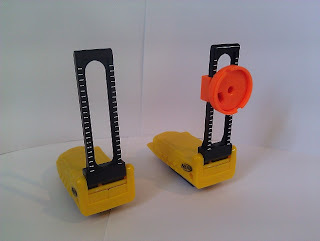 Orange Mod Works have also just released their new stage 1 kit for the Nerf Alpha Trooper, along with an extensive modding guide for it. You can view them here. I've just bought an Alpha Trooper, and I think it's great. A review of that will be coming soon too! The Nerf Recon CS-6 was released in 2008 and is still today the second best selling Nerf blaster in the UK. Most reviews of the gun do not take into consideration the multitude of new comparable foam blasters since the Recon was released, and I hope therefore that this review can be useful to anyone considering buying one (or another one) in the near future. 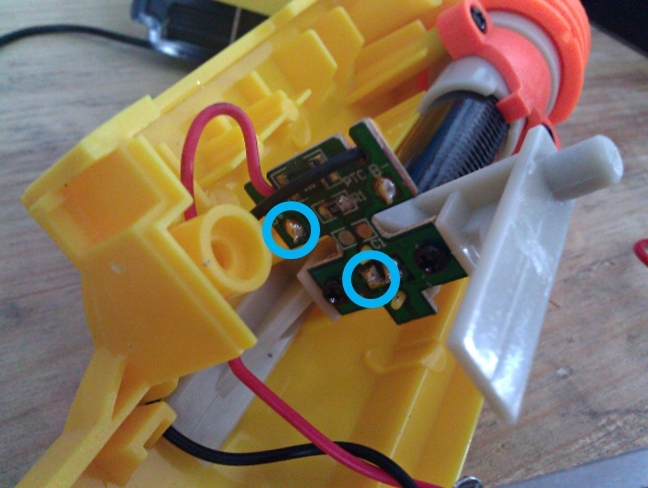 All images with the sgnerf watermark are used with permission from SG Nerf, you can read his review here. 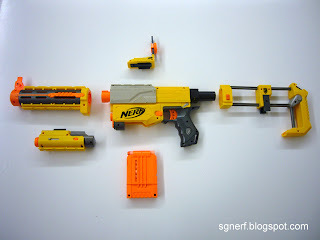 The Recon is a modular Nerf gun, which can hold 6 (or 7 if you squish them) foam darts in removable orange magazines. 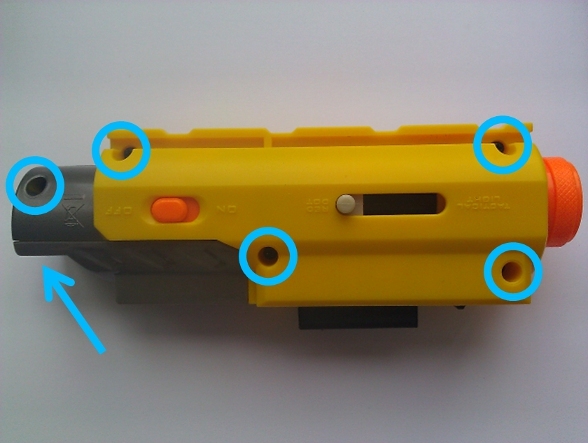 It is primed by sliding the large grey top section of the blaster backwards and then pushing it forwards again. The Recon is very comfortable and easy to use, even for people with massive hands due to it's slightly-larger-than-children's-toy size. The average firing range of the Recon is around 25-30 ft, a perfect combination of distance vs "ouch you hit my nose" (I.e. not painful at close range) for indoor wars. This range can be increased significantly above even 80 ft with modifications which will be covered in another post. The stock which comes with the Recon can hold an extra ammo clip, (which must be bought separately - more on this later), and is more sturdy than it looks. The extended barrel has been found to very slightly decrease the blasters range, but also adds two tactical rails to the front of the blaster for other attachments. 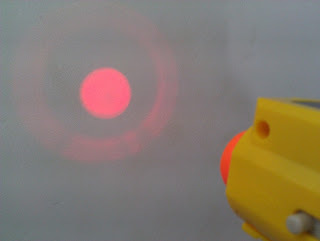 The red dot "laser" attachment requires two AAA batteries and emits a weak red light. This piece is almost useless unless modified due to the red-dots near invisibility in bright light, and the fact that you can aim a Nerf blaster well enough by eye. There is also a small aiming-piece included but this suffers from the same "un-needed" issue as the red dot part. 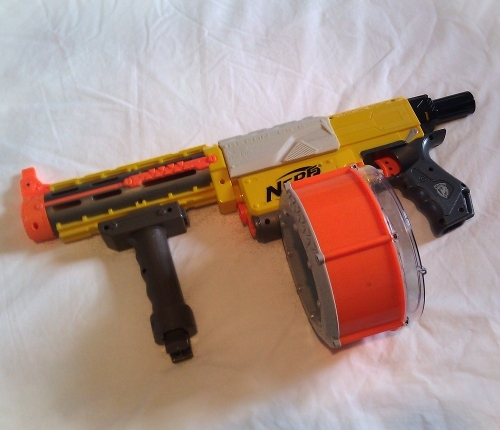 The Recons biggest rival, is the slightly cheaper, best selling Nerf Maverick. Most experienced Nerfers see the Recon as a straight up upgrade from the Maverick, as the Recon has slightly longer ranges, more customization and modification options/potential, and has removable magazines that can be switched much faster than reloading all 6 chambers of the Maverick. That being said, the Maverick is a better blaster to start modding with because of it's more simple firing mechanism, lower price and the amount of very basic mods that can be done to it - like making the barrel swing out further. 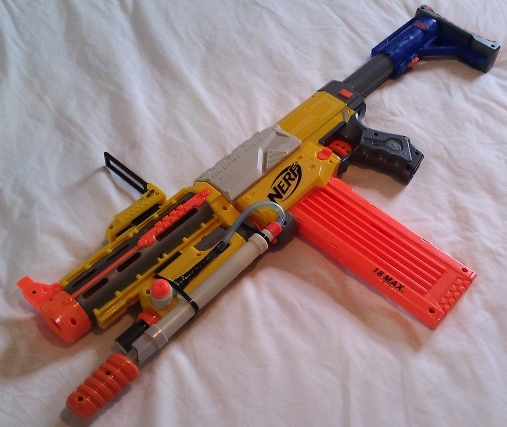 A more recent competitor to the Recon is the Nerf Barricade RV-10,this blaster suffers the same downsides as the maverick in terms of range, modability and lack of removable magazines (or not), as well as being noisy because it is an electronic fly-wheel blaster. However the Barricade does have the huge advantage of being able to be dual wielded. The Recon can also be compared to the Deploy CS-6, Alpha Trooper CS-18 and Raider CS-35, all of which have "shotgun" grips rather than the on-top-pistol system. These blasters are quicker to fire, with the Raider and Alpha Trooper being able to achieve a great rate of fire because of the "slam fire" function and ammo capacity. The Recon, however, is significantly smaller than all of these without it's attachments (or not, again), and is more modular and much easier to open up and modify. I also find the Recon to have a more sturdy feel than the Deploy. The Recon can use nearly all of the Nerf N-Strike accessories, most importantly, I highly recommend getting extra 6-dart clips, or even trying to get hold of an 18-dart Stampede clip or two off ebay. The Recon can use the Raiders collapsible stock - which is widely regarded as better than the Recons usual - as well as the Raider's awesome 35-dart ammo drum. The Raiders drum is too heavy to allow some people to use the Recon as a pistol with it attached, and it is also slightly uncomfortable to use with your hands on the extended barrel/red dot attachments because the drum sticks out so much to the side. Below are a couple of examples of how I use my Recon. The first is using the Stampedes front grip, making it more comfortable to use the Raiders drum mag. The second includes a high-powered extra-shot hacked into the red-dot attachment and a modified, easier to see through sight. I'm hoping to get some paint on this thing soon, so look out for it! Overall, I would reccomend this blaster to anyone. It's design has stood the test of time (not as much as the Longshot of course), and it's versitility makes it suitable for people new to shooting eachother with foam, Nerfers with several blasters, and even new or experienced modders who may be trying to get huge ranges (visit Orange Mod Works if your one of them). Cheapest and easiest to modify clip-accepting blaster. Smallest and lightest clip-accepting blaster. Range is better than the Maverick, and similar to larger blasters. High cost if buying more clips is taken into account. Pistol-priming slower than pump-action"shotgun priming". Low capacity clips (6 darts). Stock is not as sturdy as the Raiders. Have you got anything to add to this review? Maybe you've got a picture of an extravagant attachment "loadout" or mod for the Recon? Post a comment!